and save it to *.iso or *.bin/*.cue (or exports it to *.ps2 or *.iml/*.ims). Allows you to create CDX and UMCDR from ready to use *.iso . In addition, the user has full control over the LBA! Very simple and convenient to use. with checksum and work perfect in my test. 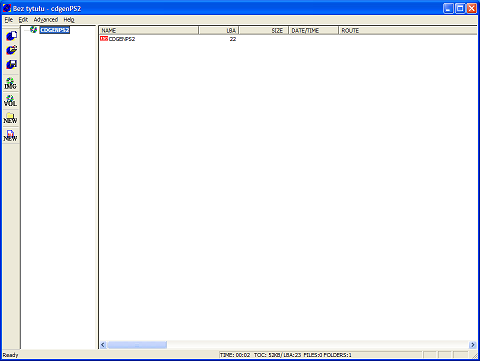 The .ISO format in old versions, before  created corrupt images. CDGENPS2 3.0 support also, the conversion of ISO to CDX or UMCDR formats. See in menu->Advanced->Create CDX (or UMCDR) from ISO option. ADVICE: In root folder use ONLY names 8+3 (ISO1). LICENSE TERMS: This software is completely free for NOT commercial use.